I should have been in bed hours ago but what are you supposed to do the day your record goes to No. 1? Roma ordered champagne - but we hardly had time to touch it with the phone ringing. What a homecoming - arriving in Gweedore in the limo to be greeted by parades, bonfires, meeting old friends and sharing a wonderful celebration. I think this is going to be the best Christmas in years. 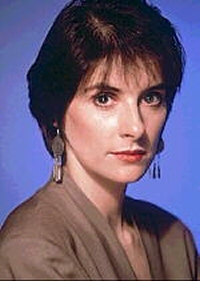 When Enya's Watermark was released last September, few outside her closest associates could have predicted the runaway success which would ensue. To date, the album has clocked up worldwide sales of over 3 million copies with the 'Orinoco Flow' single topping the charts in many countries, including Britain, Holland and Venezuela! To promote her records, Enya undertook a gruelling promotional schedule, in which the term 'globe-trotting' took on a new meaning, This is an account of those travels... in her own words. 14th September: And now the hour is here! After so much waiting, so much anticipation, the record is finally out. The party was strange. The Serpentine Gallery is a lovely place but it's very chic and I think it added to the tension we all felt. We didn't know anyone and what can you say to so many strangers? I'll know better tomorrow how people really feel about the record, when we get down to doing the interviews. Rob Dickins seems confident. Nicky is very tense. Am I nervous? I'm not sure. 16 September: What a night! If I'd known what was going to happen I don't think I'd have got up for the flight back this morning. The party was much more relaxing and enjoyable. I think it helped that Mum and Dad were there - it felt more like home, even if it was the Westbury Hotel! It's so hard to know who's being sincere - but I'm really beginning to believe that people like the album. 8th October: Belfast was... Belfast. The interviews went well - but lots of small things went haywire. I tripped on the pavement, my umbrella blew inside out. Roma says that some good has to come of all of this. "For every bad thing that happens, you move up the charts one place". The way things are going we'll be at No. 1 in no time! 9th October: We're at No. 29! I knew we were doing well but this is amazing. Rob rang - I think even he was taken completely by surprise. 11th October: On Nighthawks chatting with Shay Healy. How did it go? The programme was very relaxed and casual but I was nervous. I hope it came over well. 13th October: It was hell waiting for the midweek placing. Nicky wouldn't say anything as long as the Iris cameras were rolling. His face was so solemn, I thought we had gone down. I don't know how he could keep it in - it looks like we're at No. 11. 16th October: It's all happening so fast. We're at No. 5. It was so frustrating having to miss the charts because of our flight - but then it was so wonderful to hear the news on the phone to Roma in the limo on the way in from Heathrow. But where is it all really going to lead? 19th October: Even now it's hard to believe I was on Top Of The Pops tonight. I was so nervous - but the people couldn't have been nicer. It's a pity they didn't have enough flowers to do Rob's idea justice but I thought the set looked lovely anyway. 23rd October: I should have been in bed hours ago but what are you supposed to do the day your record goes to No. 1? Roma ordered champagne - but we hardly had time to touch it with the phone ringing. Rob was the first to call. "It couldn't happen to three nicer people", he said. But I know it's a triumph for him too. Imagine that all this should happen with a song that was only put on the album at the last minute, Roma coming over specially from Dublin with Ebony and Persia to write the lyrics. It was all done in such a rush and yet it felt right. Obviously it was. 4th November: More interviews. Time constraints too tight but I'm happy with 'Evening Falls' and I can do 'O�che Chi�n' as the b-side. My favourite carol - an unexpected bonus to be able to record it in Irish. 9th November: Oslo. There's snow everywhere and it's dark at 3 o'clock in the afternoon. Might be a nice place for recording a video! 10th December: It's back on the merry-go-round. Today London, tomorrow Hamburg, Cologne, Munich and back to London. My head is beginning to spin at the prospect but now that we're in the German Top Ten there's no calling off this trip. 20th December: The most hair-raising day yet. We had a 4am start to do breakfast TV - even still, a 10am flight to Amsterdam left us only 75 minutes before our flight was leaving Heathrow. Nicky got on great with our driver. A former policeman and stunt driver, he made zooming in and out of traffic feel like a Sunday afternoon drive in Donegal. We made it! 24th December: What a homecoming - arriving in Gweedore in the limo to be greeted by parades, bonfires, meeting old friends and sharing a wonderful celebration. I think this is going to be the best Christmas in years. 31st December / 1st January: Dad brought in the New Year playing saxophone in the pub. Afterwards the party really got underway. I went to bed at 9. Up at 2.30. Began the drive back at 4. At least it was Bartley driving! I feel fine. 3rd January: More interviews. London, Paris, Rome. I won't be back in Dublin for two weeks and then it's off to the States. Trouble is I'm never able to slow down and look at any of these wonderful places. It'd be lovely to be able to stop and think. 21st January: Los Angeles doesn't look very pretty out the windows of a limousine. Or maybe it's just that the jetlag is getting to me. Nicky is exhausted and I feel sick. They told me it never happens but it rained today in Los Angeles. An omen? 3rd February: Los Angeles, San Francisco, Toronto, Montreal, New York, Boston - I hardly have time to breathe. I've even started doing interviews at the airport. Too much flying - can I bear to see another plane? Still it's worth it - the album is flying too! 13th February: The BPI Awards Show in the Albert Hall. Nominated twice but we didn't win. I've never seen such a roomful of celebrities as at the party afterwards. I enjoyed talking to David and Elizabeth Emmanuel who have some interesting ideas for clothes. Nicky and Roma seemed to enjoy themselves. 19th February: San Remo. It's such a grand resort - the sun is shining and it's warm. There's two shows - at least I had time for shopping. I bought some beautiful sculptures - a choir of angels - by a local Italian artist. 24th February: What a trip. Since we arrived yesterday Roma has done nothing but laugh - and eat! She's so giddy. Still I don't blame her after the invasion last night. There was a Parisian bug in my suite - we called him George. Roma phoned the concierge to have him removed but he obviously didn't do a very good job. Half an hour later George hopped over my shoulder on to the page of the book I was reading! The two of us ended up running around the rooms in our nightdresses. Roma finally managed to deposit him way off down the corridor. The heroine. 25th February: Our only night off in Paris - and it rains, but it didn't keep us from the shops! 10th March: The IRMA Awards - I received the Best Female Singer award. It was a lovely night and Rob flew over for the 'anniversary'. I can't wait to fly to Japan tomorrow. 16th March: The Japanese are so gentle and courteous. Everywhere we go they present us with gifts. The most exquisite is a beautiful bridal kimono, a present from a promoter who wants us to do concerts here, and a pair of lovely sandals to go with it. He gave one to Nicky for Roma too. Tomorrow night; St. Patrick's Day! - we're invited to a party at the Irish Ambassador's residence. 18th March: My favourite place we've visited. You can go from our ultra modern hotel to a Buddhist temple next door. The tradition is to ring the bell, clap three times and make a wish. I made a wish! We went to an authentic Japanese restaurant and the food was delicious. And the album's already gone gold here. What more can I ask? 20th March: That was the worst flight ever - and Nicky slept through it all! I don't think I'll be travelling from Tokyo to Sydney again in a hurry! 31st March: The interviews started early today with a TV show and a couple of journalists following me around from breakfast on. At least they waited till I got out of bed! Did a radio interview driving around in a limousine commenting on the city. Auckland is a pretty place - and New Zealand reminds me of Ireland! 20th April: We're still selling well in so many countries it's hard to believe. Obviously, we struck a deep chord with people. 24th April: What delightful timing. Our one day off since we're in Sydney and I have the chance to see (uncle) Eoin. 10th May: The first Monte Carlo World Music Awards and we took the award for the best video. Both Nicky and Roma were here and we made it the most relaxing promotional trip of all that we've done. The helicopter journey from Nice into Monte Carlo was really spectacular - though I think Roma was a bit nervous. Bianca Jagger was presenting an award and we stood backstage talking. Her dress was very beautiful. She told me it was from India. Storms in Africa seems to be going down well. 17th May: Had a very early start and did interviews all day. WEA Spain had arranged a tour of Madrid for us so we didn't have a choice to chance to eat. Was presented with the most beautiful fan when they discovered it was my birthday. Back at the hotel I asked for toast and hot chocolate. I couldn't see why they found this so strange. I soon realised they didn't understand - they brought me a cup of melted cooking chocolate. 20th May: My very last official promo for 'Orinoco' and guess what happens? My luggage finally gets lost for the first time, after all these airports and all those hundreds of flights. 10th July: The album at No. 1 and I've been given an award for the Best International Female - in Venezuela. It's a pity we can't go there for promotion but we've already committed to work for Japan. Having written the song Roma would have loved to travel up the Orinoco for a day or two. Maybe next time!